The increasing need for trained and knowledgeable service providers to work with the aging has been well documented in recent studies. Gutheil writes in her introduction, "growth in the number and proportion of older persons is one of the most dramatic and influential developments of this century, and we must anticipate and address the needs of this burgeoning older population. One anticipated result of the increasing numbers of older persons, especially the oldest old, is an unprecedented demand for support services for older people and their families." By bringing together practitioners and educators active in the field of elder care, this book examines current concerns and practice issues. Several topics now receiving considerable attention in the fields of aging and social work such as elder abuse, ethical issues in long-term care, the challenges of interdisciplinary teamwork, and the impact of our current economic environment on social agencies, are brought together for the first time in this volume. Timely chapters incorporate current thinking on concerns professionals struggle with on a daily basis. 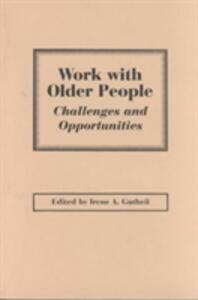 The chapters reflect the remarkable diversity of the challenges and opportunities in work with older people. Some of these challenges are frustrating, some invigorating - there are many opportunities for stimulating and gratifying practice. A valuable tool for both classroom use and for professionals in direct practice, the book contains two sections, the first provides foundation knowledge essential for work with older people and their families; the second examines current issues in the field of aging. There are the kinds of complex issues that confront professionals in social work, gerontology, counseling, and other fields with a commitment to serving older people and their families.